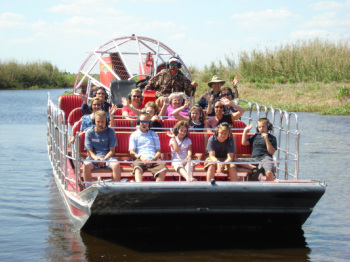 On this adventure, we will travel from Canaveral National Seashore (CNS) to Merritt Island National Wildlife Refuge (MINWR), the Indian River Lagoon (IRL), and the St. Johns River, exploring Florida’s Water Systems from a creationist perspective. At CNS on the Atlantic Ocean near Titusville, we will begin with an orientation and beach activities at this saltwater ecosystem. Then we’re off to the MINWR Visitor Center where we’ll look at the educational video and displays. Next, we'll go to IRL, a brackish water environment, where we will wade into the water with seining nets and equipment. Science Partners' "Capture and Release Permit" allows us to study the marine specimens we catch in our nets and then return them to the water. 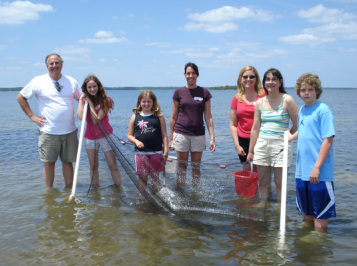 We never know what we might find, but on previous field trips, participants have caught a variety of specimens including fish, shrimp, crabs, seahorses, jellyfish, puffer fish, horseshoe crabs, stingrays, and more! Sometimes we see dolphins and manatees. Our last stop is the St. Johns River floodplain where we’ll study the plant and animal life of this freshwater habitat from an airboat! Keep a look out for alligators, bald eagles, turtles, and more. We will also have the opportunity to hold a live alligator, so bring your camera! Cost: $35 for 3-12 years and $39 for 13 years and over. CNS Entrance Fee: If your group does not qualify for a fee waiver (tax-exempt schools must apply), the CNS entrance fee is $5 per car (subject to change), unless you have a National Parks pass. Join our Florida's Water Systems field trip on Friday, March 29, 2019.